Registration is now open to attend the second annual ESPAFEST Plein Air Festival in Eureka Springs, Arkansas; May 21-25, 2017. In 2016 sixty artists from across the country came to Eureka Springs for four days of intense plein air painting in and around the beautiful town. This is the second annual ESPAfest features new locations and events. Two pre- and post workshops are offered. Click HERE for registration and information. This event is hosted by the Eureka Springs School of Art. Don't forget the OPS will visit Eureka Springs in October. Be sure and register for that event, too. It’s with pleasure that I share with you the newest members to be awarded Master Signature status by the Outdoor Painters Society (OPS). Tina Bohlman, Diane Frossard, and Rusty Jones were elected by ballot vote of the entire Signature membership body in December. To qualify for this special recognition, all applicants must meet the following requirements to be considered: 1) Be a Signature member of OPS for the last five years. 2) Exhibited in the last three Plein Air Southwest Salons. 3) Received an award in three of the annual PASW Salons. The Outdoor Painters Society has grown significantly over the years and has become an important part of the plein air community. It’s members come from many parts of the country and include some of the top names among plein air painters. 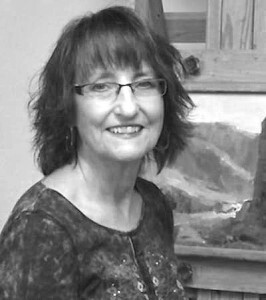 I thought you’d be interested in learning more about these wonderful artists that have achieved this well-deserved recognition ~ John P.
On the days she’s not teaching, she’ll spend three hours painting in the morning and three hours in the afternoon. She grows her own flowers and tries to paint in the garden as often as possible. In addition to her weekly classes she also teaches an occasional workshop. If she could hang out with three artists of the past for just one day, her choices would be Joaquin Sorolla, Edgar Payne, and Sergei Bongart. Her three favorite books are: Brushwork, Emile Gruppe; The Scenic Journey, Edgar Payne; Everything I Know About Painting by Richard Schmid. Firstly, jettison anything from your painting box that you don’t really need. Ask yourself, do you need any army of brushes when painting studies on location, or just one or two? Or even any brushes at all? Is it possible to create a painting using found materials? Limited palettes rule when it comes to travelling light. I use just five colours: Burnt Umber, Cadmium Yellow, Phthalo Green, Winsor Blue and Titanium White. A careful consideration of chosen colours before setting out can be beneficial, but so can working with the few colours that you already have with you. Don’t forget that you can mix your own greens, and the fewer colours you use the more harmonious the result. Unless you are painting in the middle of a desert, there is really no need to carry heavy painting water. It's usually pretty easy to find a supply of water on site for your painting needs, including rivers, streams, the sea, rain-filled puddles, a local service station, shops and restaurants. The added bonus of 'found' water is that it is local to your painting location, tying your work to its surroundings. And don't worry about the seawater longevity myth; after all, Turner used seawater for many of his coastal water colours and they still look good! I always carry a small handful of freezer type bags when painting outdoors. These are for collecting found materials for later use and inspiration. When painting on the coast, for instance, these bags may well contain shells, sand, seaweed, driftwood and other beach paraphernalia. Painting in the city, my bag contains packaging, discarded tickets and paper ephemera. You’ll find similar useful and enriching materials in forest and mountain settings. And when you return to the studio, revisiting these items will transport you back to your outdoor location, readying you for indoor work. Found items can all be used to create interesting textures and make your work more visually compelling. For an artistic challenge, try creating a piece of art on location using only such materials. I often use this technique to get my creativity flowing. Take a camera or smart phone with you when painting en plein air. Painted studies capture atmosphere as no photograph ever could, but a camera can capture details in an instant. Using a photograph as a visual reference for your painting can ensure consistency in your work in the face of changes in climate and the like. A good Pochade box can be really useful, not only for packing your items but also to act as a small easel. And for larger plein air work, a box easel, sometimes called a French easel, is fantastic. Though you may be contending with bright sun at times, sunglasses alter colour balance and can therefore affect how you perceive and use your palette. Wear a hat to insure against this effect and protect yourself from the elements. In Texas, one lively plein air group had a Christmas party that looked like a lot of fun. And everyone went home with a new piece of art. The Outdoor Painters Society held a Christmas lunch and a painting swap in the Dallas area that fueled quite a bit of conversation online and off. “This event is everyone’s favorite of the year with fun, food, and camaraderie,” says Randy Saffle, the vice president of the OPS. “Members bring an 8”-x-10” painting (unframed) wrapped in plain brown paper. After lunch, the fun begins when we start the ‘Chinese Gift Game’ with the unidentified paintings. We draw numbers out of a hat from one to whatever. The artist with #1 picks a painting from the stack and unwraps it. New DVDs added to OPS Library! Nancy Tyler our DVD librarian advises we have 2 new DVD's available! Go There NOW & check them out! Note: This post first appeared on Oil Painters of America Blog. Great article by OPS Signature member RUSTY JONES. You can access Rusty's website & contact information in the OPS Signature Member Directory. “Notan” is a Japanese term referring to exploring the harmony between light and dark. Artists use Notan sketches to explore the composition elements of a scene and the relationship of major shapes. A good Notan drawing simplifies a scene into three values…dark, light and halftone. It also acts as a memory and planning tool that helps the artist focus on essential elements of a scene, draw simple shapes and record important elements should the scene change as weather and sunlight alter a scene. I was first introduced to the importance of the Notan sketch in a workshop I took with Skip Whitcomb. Skip starts every painting session with two or three quick sketches of the scene. The process takes him about thirty minutes. As part of the workshop Skip required students to do at least three sketches before starting a painting. Since that time I have come across many artists that rely on the Notan sketch process and for years it has been my practice as well. The advantage of a Notan sketch over a camera is the camera records everything in the scene indiscriminately leaving nothing to the imagination. That being said I have come to prefer the camera over the sketch as the smart phone increasingly takes over every aspect of our life. Using the photo app in my iPhone has reduced the time to produce a Notan to a matter minutes rather than a block of time that cuts into painting time. I recently took the opportunity to produce a Notan sketch and a Notan photo to decide once and for all what my routine was going to be going forward. Below are my results. South of Monterrey on the way to Big Sur is this amazing scene, painted by many. On the day of my painting the fog was rolling in and out all day constantly changing the light. The scene was so captivating it was hard to decide what to leave in and what to take out. It was the perfect time for a Notan sketch so by the time I put brush to canvas most of the major decisions would have already been made. Like many plein air painters my “go to” format is the horizontal on a 9″ x 12″ or 12″ x 16″ panel. I also like the long, narrow horizontal format I use frequently in Texas due to the lack of mountains or anything taller than a fence post. My first inclination was the long horizontal as seen in my Notan which took about ten minutes. Just for kicks my second sketch was a square format and my third sketch was my usual horizontal. The whole process took longer than expected because of the fog that would come in and obscure the distant cliffs that I wanted to include in my painting so all total it took almost forty minutes to get the sketches done. to look at the scene in different formats. I first looked at the long, horizontal format, cropped it accordingly and saved the image for future reference. Then I cropped the same photo in the more typical horizontal for a 9″ x 12″ painting. Again I saved it for later. Then I used the halftone filter to give me a Notan photo of my scene. The whole process took less than ten minutes which is an important consideration when the goal was to produce four paintings this day. When it came time to paint, the fog became unavoidable. In the end I gave in and included it in my painting, but the Notan exercise was well worth the effort. Below is another example of sketch versus photo Notan. There is something that makes me feel more “artistic” drawing Notan sketches before beginning a painting. But at the end of the day, for me at least, its all about evaluating the scene for composition and values and the iPhone provides me the quickest means to an end while also providing me a permanent record. In less than ten minutes I can produce several Notan photos with complete halftone evaluations of my scene and I think it gives me a clearer understanding before I begin to paint. The post Notan Sketch VS. iPhone 6 appeared first on Oil Painters Of America Blog. NOTE: The following is an in-depth "conversation" between two of OPS' top signature members, John Pototschnick and John Cook.......read on; you're really going to enjoy this!! What makes Cook’s work so incredibly appealing to me is that it comes across as being created by one who is absolutely fearless. He does things with a brush and palette knife that I can only achieve in my dreams. What I need to define and explain, he is able to suggest with just a few strokes of the brush. His work is powerful and emotionally charged. Fellow artists love his work for they recognize his amazing talent and his ability to apply paint in such an attractive manner. His work is just exciting and inspiring when seen firsthand. I often ask myself, “How does he do that?” Yet, if you were to meet Mr. Cook, you would surely be asking someone, “Is this THE John Cook, the guy that paints all those colorful, bold, amazing paintings?” Your question of course would be justified, for the public John Cook is quiet, low key, and reserved…and that’s what I find so intriguing about him. I’ve just got to know what the deal is with him…so I asked him. You’ll love this interview and his amazing work. Photos showing the progressive steps of a painting will blow you away."